My mom’s family is from the South. According to her, you always eat black-eyed peas on New Year’s for luck in the upcoming year. More black-eyed peas meant more luck. That was the only time of year we ever ate these beans (why they are named peas, I don’t know), and I distinctly remember hating them. The only part I liked was trying to steal one or two of the okra my mom would cook in the beans. But for some reason, it is stuck in my mind that you eat black-eyed peas on New Year’s. Last year, I found this salsa and really liked it. It’s really tasty, different enough to be interesting but not weird, and really fast to throw together. I was done within 15 minutes, including “help” from my lovely small assistants. And I think there might be something to what my mom said. I ate a lot of this salsa last New Year’s, and it was a pretty great year. Lots of things went my way. If you are looking to have a good 2016, you might want to throw some black-eyed peas in your mix! 1. Combine all ingredients in a medium bowl. Stir to distribute evenly. Refrigerate if not serving immediately. Recipe notes: You can use any tomato you like. I just like a ratio of equal parts tomato to beans, so add tomato until you get there. 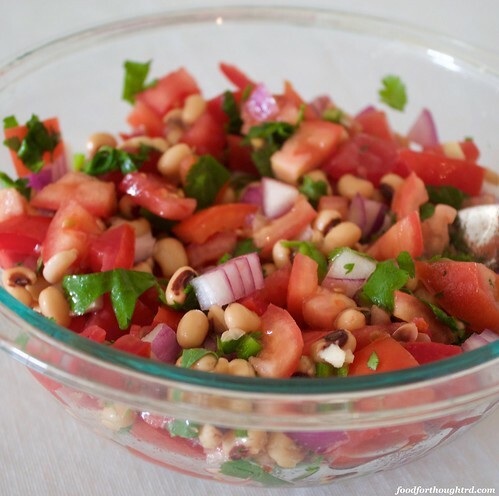 This is basically a recipe for pico de gallo with some black-eyed peas thrown in. You can adjust any ingredient to you preferred level. I have been a bit skimpy on the red onion, because I find them quite strong when raw. The original recipe called for a poblano pepper. It was yummy when I did that, but either pepper works well. You might want a pinch of salt. Just depends on how well you rinse the black-eyed peas, since there is a lot of salt in the can liquid.